Chemotherapy infusion is one of the most common and effective cancer treatments. It has been in use as a cancer treatment since the 1940s, when Dana-Farber founder Sidney Farber, MD, used it to achieve the first clinical remission ever reported for childhood leukemia. For a treatment that has been around such a long time, you might be surprised to learn that preparing chemotherapy for infusion can be quite complicated. It’s a complex process involving medications that need to be individually made to order for each patient. In fact, most chemotherapy and immunotherapy treatments are customized at each appointment based on factors like the person’s blood test results and weight – so they can’t be prepared ahead of time. The hospital pharmacy prepares medications in advance whenever possible, but some drugs expire quickly after they are prepared. They must be made within a specific timeframe to ensure that they do not expire before your infusion is complete. 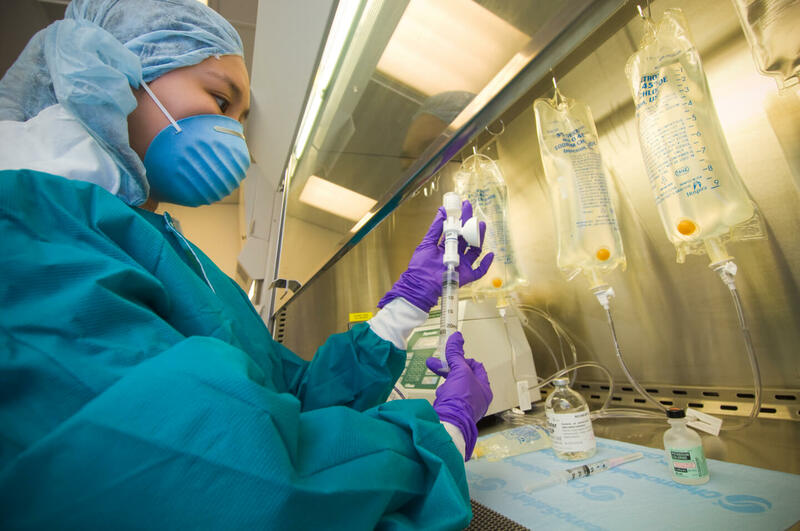 A pharmacy technician prepares infusion medication in a biological safety cabinet. When you arrive for your infusion appointment, members of your care team will check your height, weight, and vital signs, and draw a blood sample that will go through a variety of laboratory tests. Your doctor will evaluate you and then write orders for your infusion medication based on your cancer type, vital signs, height, weight, and blood test results. Your nurse double-checks the medication order to make sure all necessary components are included. If the order looks OK, your nurse sends it to the hospital pharmacy for preparation. Two pharmacists again review your vital signs, laboratory results, and medication order to confirm your therapy is appropriate. A pharmacy technician gathers needed supplies to make your medication in a sterile environment known as a clean room. In the clean room, your medication is prioritized and a pharmacy technician prepares your medication in a biological safety cabinet, an enclosed laboratory workspace to further protect drugs from contamination. The finished medication is checked by another pharmacist to make sure it was prepared correctly. Finally, the technician sends your medication to your infusion clinic floor, where your nurse will again check its contents and prepare it for infusion. A number of experts, including members of a specially trained pharmacy team, are involved in entering, preparing, and checking every medication that goes to a patient. For example, pharmacy staff will double-check that each order’s dose, drug type, base solution, bag type, and tubing match those ordered by the doctor. Dana-Farber’s pharmacy has more than 200 staff members – all focused on quality and safety. In total, at least eight Dana-Farber pharmacy staff members come in contact with any given medication order that needs to be prepared in the clean room. Learn more about what to expect at your first chemotherapy infusion appointment. Excellent article. Provides a comprehensive insight to the process. I receive clinical trial immunotherapy infusions every other week and often wondered why it seemed to take such a long time to get into the infusion suite. I am so impressed with the process and checkpoints that each infusion is subject to. This information should be put in a poster format and available for patients to read in the infusion suit waiting areas. I often hear people making remarks on the length of time they have been waiting and this would be helpful to them to better understand the process.